The Egyptian Football Association (EFA) has announced they will use Cairo Air Defence stadium to host Premier League matches, despite a recent disaster that left 20 Zamalek fans dead. "No talks yet regarding excluding Cairo Air Defence from upcoming football matches," the association's Executive Manager Tharwat Swailam told an Egyptian TV programme on Wednesday. 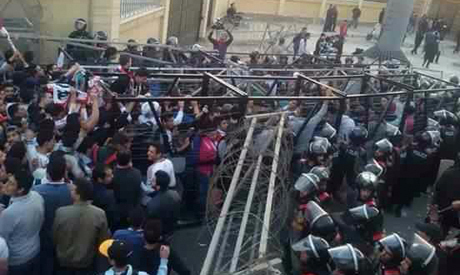 All football activities have been frozen in the country since 8 February when 20 Zamalek supporters were killed after police used teargas to disperse a crowd of fans attempting to enter the Air Defence Stadium ahead of a league match with ENPPI. "We just decided to move the Olympic team game with Kenya [in the first leg of the 2015 Africa Games qualifiers] to the Cairo Stadium to respect the victim families' feelings. Zamalek's match [in round of 32 of the CAF Confederation Cup] is to be held mid-March in Gouna in order not to over stress the security during the economic development conference in Sharm El-Shiekh," Swailam explained. The Egyptian Cabinet announced on Wednesday that the competitions are set to resume after 40 days of mourning for the victims. "The league will proceed as scheduled and only 15 board members for each team will be allowed to enter in one vehicle in coordination with the police to avoid any possible security troubles," he added. Most Premier League games have been played behind closed doors since over 70 Ahly fans were killed in February 2012 after they were attacked by Masry fans in Port Said Stadium at the end of a league game. "We are coordination with the Interior Ministry and we are finalising procedures of the league resumption and the summer window transfer. The league may be extended to late July and we will be in coordination with the FIFA to legalise our decisions," the EFA official stated. Two league seasons were suspended midway in the wake of the Port Said disaster while extra-ordinary procedures were taken due to the country's unrest.